Simply put, KODAK INDUSTREX MX125 Film is tough. Tough as nails. Its static resistance is unparalleled in the industry, and its heat resistance is remarkable. The fi lm is extremely durable; it can withstand the toughest handling (and even darkroom practices). It can also survive high humidity, and it’s much less susceptible to handling artifacts than most films. 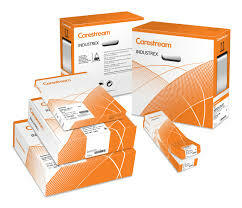 MX125 Film incorporates Carestream Health’s patented T-GRAIN Emulsion technology. This medium-speed fi lm offers very fine grain and very high contrast. It has excellent sensitivity, so it’s perfect for critical radiography—especially with high energy. You can use it with direct x-rays or with lead foil screens. This fi lm is classifi ed as ASTM E 1815 Class I.
MX125 Film can be processed manually or automatically in a range of processing cycles. Replenisher and KODAK INDUSTREX LO Fixer and Replenisher.